The PlaygroundSquad facilities are open 24/7 (with the exception of major holidays) for those who want to spend some extra time either honing their craft or playing games with other students outside regular school hours. To prepare students for the industry, we provide an environment that is as closely matched to a real game studio as possible. Upon arrival you are given your own workstation with a powerful computer and all the equipment you need in order for you to start learning the ropes immediately. Each workstation is personal, and students often personalize their desk to their own liking - we're all individuals, after all. Each discipline is given separate seating areas to make it easier to help each other out and collaborate during their courses. The only exception to this is during game projects, when the project groups move to sit next to one another in a very cabal-like manner. We house an industry-leading motion capture system manufactured by Qualisys. Students are free to use this at any time whenever they want to record an animation, or when they merely want to wear tight clothing. Since PlaygroundSquad is housed in a modern office buiding, students also have free access to book any available conference room for a private meeting with their group, or any other reason. Our common room, Challenge, is free for anybody in the whole building to use. Students, teachers, and other tenants come here for lunch, coffee, and everything in between. In addition to this, extracurricular activities such as drawing nights, board game sessions, and gaming tournaments are often held here. 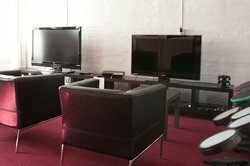 When the going gets tough and you need to take a breather, walk downstairs and enjoy our fully equipped gaming room. With everything from retro games to the latest and greatest, you're sure to find something to your liking. Anybody may use this room or book it outside of school hours with their classmates. 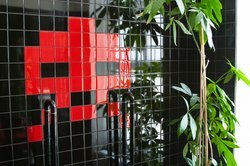 They have pixel art tiles. Just sayin'.